Ok, so we don’t have a rainbow with a pot of gold at the end, nor do we have any green beer for you. But you can feel the luck of the Irish by stopping by Autoplex Customs and checking out what we can do for you to upgrade your truck, SUV, or Jeep. You may just find that we have exactly what you didn’t even know you wanted. How lucky is that? We offer so many awesome ways to make your current truck or SUV so much better. From upgrading your tires, to adding a lift kit, to adding a new bumper, those are just some of the ways we can make you feel like the luckiest driver on the road. With awesome tires like our 22” American Force Wheels Toyo Open Country R/T Tires (37X13.50R22LT), 22” American Force Wheels Toyo Open Country M/T Tires (37X13.50R22LT), or 22” Fuel Off-Road Wheels - Hostage DF31 Toyo Open Country M/T Tires (35X12.50R22LT). Give your ride the lift it needs with our 5-6" Kelderman Air Suspension Lift Kit or our 6" Full Throttle Suspension Lift Kit. By customizing your Jeep into a lifted Jeep Wrangler you will increase the ground clearance, suspension travel, and make your Jeep even better suited to fit larger tires. All of this is perfect for the ideal day of off-roading. For those who enjoy more serious off-roading, our lift options are optimized for off-roading. We’ve got a great selection of lift kits and tires to take your Jeep to the next level. Not only can we upgrade your ride with new tires, lift kits, and bumpers, we can also upgrade the color of your ride. With both paint and wraps in any color you can dream of, the possibilities are endless! Feeling the true luck of the Irish? Then what better color than green?! 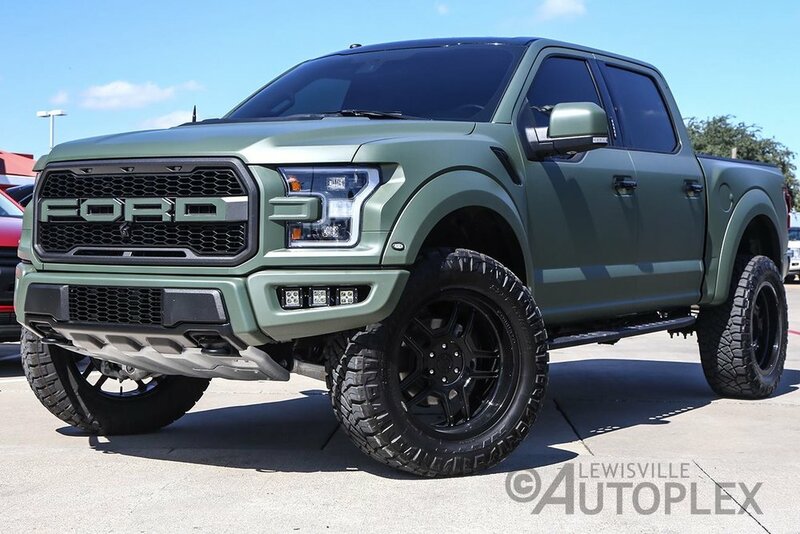 Just look at how awesome this 2018 Ford F-150 Raptor with an Army Green metallic wrap looks! We upgraded this ride for a customer in October and it still looks amazing riding down the streets of Dallas. Come in today and let us make your day a little luckier!